"Anybody can be a non-drunk. It takes a special talent to be a drunk. It takes endurance. Endurance is more important than truth." Barfly is less of a film about alcoholism than it is a film about human behavior. Though alcoholism is the core of the story, this is essentially a plot device used to explore the minds of its fascinating characters. Written by poet/novelist Charles Bukowski, a bar-hopping lush himself, Barfly avoids preaching about the pitfalls of drunken life, and neutrally presents the often comical but harrowing routine lifestyles of these afflicted human beings. While Barfly does not exactly glamorize the disease, those expecting overtly harsh lessons about the perils of drinking should probably look elsewhere. Bukowski's screenplay is a semi-autobiographical tale of the uncommon bond between two alcoholics. Mickey Rourke turns in a fantastic performance as Henry Chinaski, a down-and-out boozehound with a talent for poetry. His ability to flourish into a great writer is negated by his strong disdain towards "ordinary" life, which is exemplified through his insobriety. One night he meets Wanda Wilcox (Faye Dunaway, in a career highlight) at a local bar, and the two are drawn towards one another through a common interest�boozing. The rest of the film centers on this intriguing relationship. Though Henry and Wanda both fit the profile of alcoholics, the film refrains from portraying them as fall down, speech-slurring winos. They are two ordinary beings tormented by a debilitating illness, and they are respected as such. Wanda makes it clear that she does not want to fall in love; she refuses to go through that again. Henry respects this, and though there is implied sexual contact, the on-screen intimacy is limited to boozing. This is one of the film's strongest elements, as an unusual but tender bond is formed. The scene where the two of them share a drink and a laugh while Wanda bathes proves to be more touching than if they had jumped into bed together. Both of them claim that they do not like people, yet their relationship is refreshingly pure, open and natural. It would almost be enviable if it were not based on such pitiful circumstances. Director Barbet Schroeder has a propensity to create films that deliver with serene intensity. His attention to detail and knowledge of his subject matter often results in films that feel more like documentaries rather than works of fiction. Barfly is one of his most stunningly realistic achievements, a film that polarizes the viewer with its honest depiction of life on the skids. There are a few moments that seem awkward and extraneous, yet I suppose this is all part of this unique style of storytelling. The film moves in a vicious circle with little sense of purpose, as if it were just another desultory day in the life of a drunk, a stagnant soul caught in a cycle of blackouts and hangovers. One event leads to another in the kind of random way an alcoholic might experience life through a clouded haze of whiskey-induced inebriation. 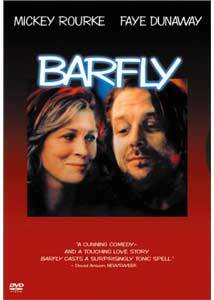 Yet, unlike the cerebral torment earned from excess alcohol abuse, Barfly is an enriching experience. It is a thoroughly engaging film, every staggered step of the way. Image Transfer Review: Though Barfly depicts the gritty and ugly world of alcoholism, the image transfer is clean and beautiful. This is one of the better transfers I have seen of a pre-1990s film. The vividly saturated color palette is lush with neon greens and crimson reds during the bar scenes, while the outside world conveys a more subdued aesthetic. Black level is excellent as is shadow detail, allowing the image to boast a nearly three-dimensional quality. The only transfer-related disturbance I noticed was minor edge enhancement, but this is never terribly distracting. Overall, this is a stunning visual experience. Audio Transfer Review: The monaural soundtrack is presented in Dolby Digital 1.0, rather than the typical but inferior 2.0 mono. The soundtrack is firmly locked in the center channel, with no detection of bleeding into the other channels. Entirely clear and free from distortion with the only downside being a noticeable lack of low end, the 1.0 soundtrack is quite commendable; I hope to see this format become the norm for mono soundtracks. Extras Review: Director Barbet Schroeder has taken the time needed to record a worthwhile feature-length commentary. Schroeder finds a nice balance between discussing the technical aspects of the film and the screenplay as well as the characters. Though the commentary contains several lengthy silences, Schroeder manages to keep his conversation interesting. I would have preferred a dual commentary with both Schroeder and Charles Bukowski, but that is wishful thinking. Flying solo, Schroeder provides an insightful track that never proves dull. I Drink, I Gamble and I Write: The Making of Barfly is listed as a documentary, but it is actually only a 12-minute featurette. Good use is made of the brief running time, with plenty of behind-the-scenes footage and revealing interviews with Charles Bukowski. Despite its brevity, this is a highly informative featurette. The most interesting special feature is Excerpts from The Charles Bukowski Tapes. During the lengthy period in which Schroeder fought with the studios to get Barfly made, he recorded hours of interviews with the wildly eccentric writer. The viewer is offered a look at four different excerpts. Basically, this is the world according to Charles Bukowski, as we listen to him preach the methods of his topsy-turvy lifestyle. This is a fascinating feature; I hope to be able to see more footage from these tapes someday. The theatrical trailer is presented in beautiful anamorphic widescreen with 2.0 monaural sound. The trailer effectively conveys the quirky nature of the film, but it is a bit too revealing. Rounding out the special features are film/literary highlights of Mickey Rourke, Faye Dunaway, Barbet Schroeder, and Charles Bukowski. Barfly finally comes to DVD in its original 1.85:1 aspect ratio, and it was well worth the wait. This engrossing film comes with a dazzling image transfer and a unique set of extras that are certain to please.